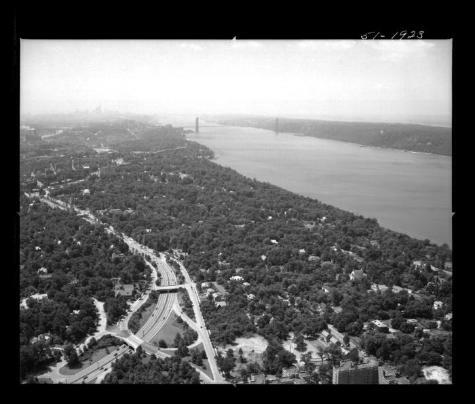 View of the Henry Hudson Parkway running through the Spuyten Duyvil and Riverdale sections of the Bronx in New York City, looking south. Manhattan and the George Washington Bridge can be seen in the distance, as can Bergen County, New Jersey on the opposite side of the Hudson River. Source: New York State Archives, Aerial photographic prints and negatives of New York State sites, 1941-1957, B1598-99. Box 3, no. 30.